FACT CHECK: Did Hungary Reduce Illegal Immigration By 99 Percent With A Border Wall? Turning Point USA founder Charlie Kirk claimed on Twitter that illegal immigration in Hungary decreased by 99 percent after the country built a border wall. “Hungary built a wall and illegal immigration collapsed by 99%” he said Oct. 22. Illegal border crossings for Hungary dropped from 391,384 in 2015 to 1,418 in 2017 after the construction of border barriers – a 99.6 percent decrease. It’s unclear, however, how much of the drop can be attributed to the border barriers, as a significant decrease in overall migration levels in the region also played a role. Hungary faced a large spike in illegal border crossings in 2015 during the height of the European migrant crisis, where more than a million migrants crossed into Europe. Most of these migrants were fleeing violence and war, coming from countries such as Syria, Iraq and Afghanistan. Hungary had over 391,000 attempted and completed illegal crossings along its external borders in 2015, up from 44,709 in 2014 and 23,608 in 2013. Many of these migrants were simply passing through on their way to other European countries like Germany and Sweden, while others sought asylum in Hungary. The Hungarian government, with the support of Prime Minister Viktor Orbán, constructed a 110-mile-long, 13-foot-high fence equipped with razor wire along the Hungarian-Serbian border, where 95 percent of the illegal crossings were occurring at the time, and another along the Hungarian-Croatian border. The barriers were complete by October 2015, leaving migrants who wanted to enter the country bottlenecked into a handful of “transit zones” where they could apply and wait for asylum. Thousands of police and soldiers manned the country’s borders. The number of illegal border crossings for Hungary dropped to 18,236 in 2016 – a 95 percent decrease in just one year. After the addition of a second fence in 2017, only 1,418 illegal border crossings occurred, marking a 99.6 percent decrease from the 2015 peak, according to information obtained by The Daily Caller News Foundation from the Hungarian government. From 2015 to 2017, however, there was also a 98 percent drop in crossings through the Western Balkan route that leads to Hungary, according to Frontex, the European Union’s (EU) border control agency. It’s therefore difficult to assess how much the drop in illegal border crossings can be attributed to increased border security versus the drop in overall migration levels, as both played a role. The EU and Turkey reached an agreement in March 2016 where migrants who had traveled from Turkey to Greece would be sent back. Around the same time, Macedonia, Croatia, Slovenia and Serbia closed off their borders, largely stemming the flow of migrants heading north. New laws in Hungary aimed at cracking down on illegal border crossers and asylum seekers likely also contributed to deterring migrants. Hungary made illegal border crossing a criminal offense that could be punishable by prison time in 2015. It also made it easier to send some asylum seekers back to countries like Serbia, which they designated a “safe country” for those seeking asylum. Hungary’s border barriers have drawn criticism from some. “If all the borders along the Balkan route will be closed totally, then all these asylum seekers will have to find an alternative route if they want to continue to come to Europe. They will be forced by the circumstances to rely more on the services of human smugglers,” Erno Simon, a senior communications officer at the U.N. High Commissioner for Refugees’ Central Europe division, told Al Jazeera. 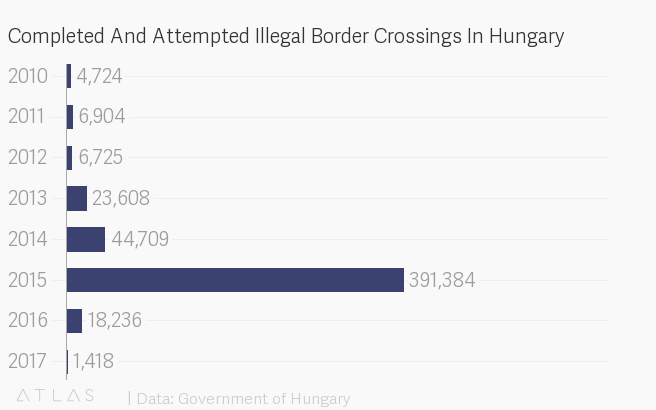 Despite this, Hungary has defended its use of the border barriers. “It was not unknown what the most effective way to handle illegal border crossings is. Like it or not, and that’s the point we always make, there is no more effective way [to stop] illegal border crossings than building a physical barrier,” Zoltán Kovács, a spokesperson for the Hungarian government, said in a 2017 interview with TheDCNF.